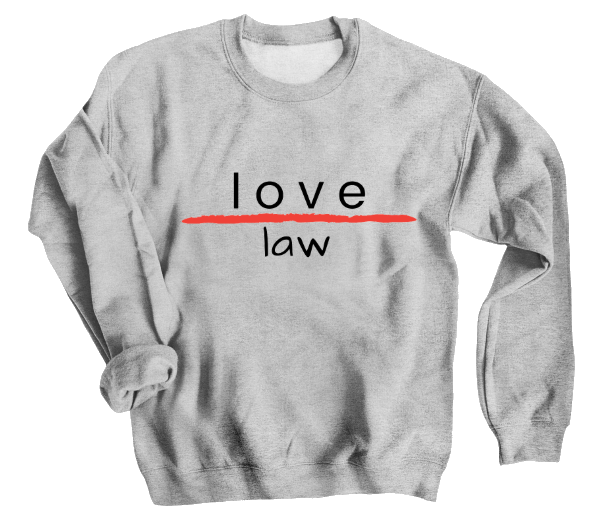 'Love Over Law' — message and merchandise — asha Olivia. The person who lives in right relationship with God does it by embracing what God did for them. John 3:16 states, "For God so LOVED the world, that He gave His only son, that whoever believes in Him should not perish but have eternal life. Love Over Law is designed to draw light to this. We are not saved or made right with God by our own efforts or by keeping of the law. Because of God's love and grace, only through personal faith and belief in His son Jesus Christ are we saved. "For through the law I died to the law so that I might live for God. I have been crucified with Christ and I no longer live, but Christ lives in me. The life I now live in the body, I live by faith in the Son of God, who loved me and gave himself for me. I do not set aside the grace of God, for if righteousness could be gained through the law, Christ died for nothing!" "Let no debt remain outstanding, except the continuing debt to love one another, for whoever loves others has fulfilled the law. The commandments, “You shall not commit adultery,” “You shall not murder,” “You shall not steal,” “You shall not covet,” and whatever other command there may be, are summed up in this one command: “Love your neighbor as yourself.” Love does no harm to a neighbor. Therefore love is the fulfillment of the law." If we can find it in our hearts to love, we can't go wrong. If we can find it in our hearts to love, we are inclined to pursue righteousness, obedience, submission, relationship, prayer/worship.. we are inclined to obey!